Ok, its a tricky title to the post, but would you honestly read a post that was titled the "Last Few Days"? I think not. So, its been a busy few days actually. First was the trip, well two trips to Citizens Bank Park to watch the Phillies and the Mets. The first game was actually a speedy one, though with Jon Lieber and Tom Glavine pitching, I should not have been to surprised. The seats were great, and the game was just over two hours. Thanks Red for getting them. The second day, was hot as all hell! Subway and I actually took the Subway, a totally different experience when it comes to Philadelphia, as opposed to New York. Its actually clean and there was room to sit. Plus, no homeless, though I can understand that one since it was hot and humid down there, probably safer on the street itself. A pleasant surprise on this visit was Bull's BBQ. Highly, Highly recommended!! The BBQ sauce actually tasted like something you would have down in Virginia or North Carolina, though now I am sorry I did not try the kielbasa sandwich. After catching up with the Father in Law and watching the Mets bomb the Phils in the sweltering heat, a shower and some relaxation was so needed. 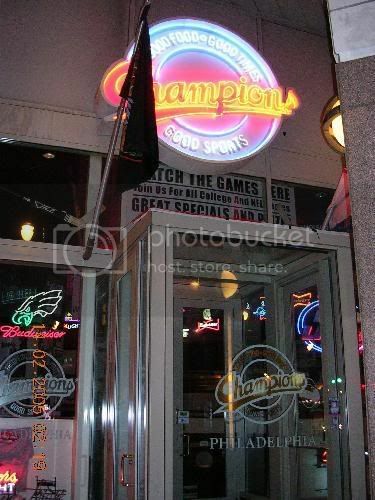 Next stop was Champs Sports Bar. One word:overrated! Fox & Hound Restaurant is 10 times better, with better food and sightlines. Plus it was just for some exhibition football, how much fun can that really be? Over the weekend, it was golf and more golf. I have to say, Tiger Woods is a phenomal player, probably the best that I will ever see. However, watching him is becoming dull. I still want to see him have to comeback and win a championship, something he still has not done yet, just ask Ben Curtis! In my own foibles on the golf course, I have to say there was good news as well as bad news. The good news, I shaved off 22 strokes from the last time I played. The bad, you say? Well it was still a 135 and I pulled some rib muscles in the process. Now I can surely say why its amazing that Nascar drivers do all that racing with rib and chest injuries. I thought I might curl up into the fetal position just making a simple left turn!